Meditation has become one of the most popular ways to relieve stress among people of all walks of life. This age-old practice, which can take many forms and may or may not be combined with many spiritual practices, can be used in several important ways. It can be a quick-fix stress reliever to help you reverse your body's stress response and physically relax. It can be a part of your daily routine and help you build resilience to stress. 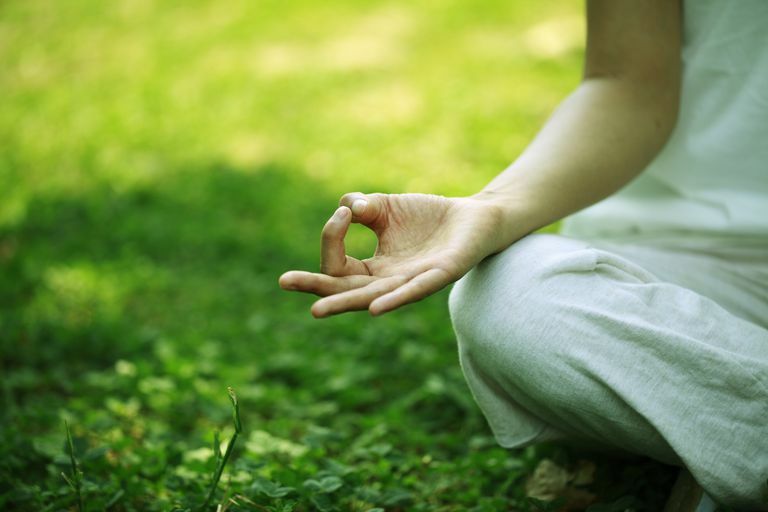 A form of meditation can even be used for weight loss and healthier eating. By learning to calm your body and mind, your physical and emotional stress can melt away. This leaves you feeling better, refreshed, and ready to face the challenges of your day with a healthy attitude. With regular practice over weeks or months, you can experience even greater benefits. Meditation involves sitting in a relaxed position and clearing your mind, or focusing your mind on one thought and clearing it of all others. You may focus on a sound, like "ooommm," or on your own breathing, counting, a mantra, or nothing at all. A common thread among the many meditation techniques is that the mind stops following every new thought that comes to the surface. It’s generally necessary to have at least five to 20 distraction-free minutes to spend, though meditation sessions can really be any length. Longer meditation sessions tend to bring greater benefits, but it is usually best to start slowly so you can maintain the practice long-term. Many people find that if they try to meditate for too long each session or create a "perfect" practice it can become intimidating or daunting, and they find it more challenging to keep as a daily habit. It is far better to create the habit and work it into a more thorough version of that habit. It’s helpful to have silence and privacy, but more experienced meditators can practice meditation anywhere. Many practitioners of meditation attach a spiritual component to it, but it can also be a secular exercise. Really, there is no wrong way to meditate. What Can Meditation Do for Stress Management? Throughout the day, when we experience stress, our bodies automatically react in ways that prepare us to fight or run. This is your body's stress response, otherwise known as your fight-or-flight response. In some cases of extreme danger, this physical response is helpful. However, a prolonged state of such agitation can cause physical damage to every part of the body. Meditation affects the body in exactly the opposite ways that stress does—by triggering the body's relaxation response. It restores the body to a calm state, helping the body repair itself and preventing new damage from the physical effects of stress. It can calm your mind and body by quieting the stress-induced thoughts that keep your body's stress response triggered. There is an element of more direct physical relaxation involved in meditation as well, obviously, so this double dose of relaxation can really be helpful for shrugging off stress. A greater gain that meditation can bring is the long-term resilience that can come with regular practice. Research has shown that those who practice meditation regularly begin to experience changes in their response to stress that allow them to recover from stressful situations more easily and experience less stress from the challenges they face in their everyday lives. Some of this is thought to be the result of the increase in positive mood that can come from meditation; research shows that those who experience positive moods more often are more resilient toward stress. Other research has found changes in the brains of regular meditation practitioners that are linked with a decreased reactivity toward stress. The practice of learning to refocus your thoughts can also help you redirect yourself when you fall into negative thinking patterns, which in itself can help relieve stress. Meditation offers several solutions in one simple activity. The benefits of meditation are great because, among other things, it can reverse your stress response, thereby shielding you from the effects of chronic stress. Your heart rate and breathing slow down. You use oxygen more efficiently. Your adrenal glands produce less cortisol. Your mind ages at a slower rate. Your mind clears and your creativity increases. People who meditate regularly find it easier to give up life-damaging habits like smoking, drinking, and drugs. They also find it easier to stop rumination from ruining their day. It helps many people connect to a place of inner strength. Numerous studies have found that, in diverse populations, meditation can minimize stress and build resilience. Meditation research is still relatively new, but promising. How Does Meditation Compare to Other Stress Reduction Methods? Unlike some medications and herbal therapies, meditation has few potential side effects. People with physical limitations may find it easier to practice than strenuous physical exercise for stress relief. Plus, no special equipment is required. Unlike enlisting the help of a professional, meditation is free. Some people may find it more difficult to free their minds from the thoughts of the day. This may make it more difficult than methods that involve focusing on these events, like journaling, or methods that are distracting, like physical exercise or the use of humor. An experienced teacher can be helpful but isn't absolutely necessary. You can learn many effective meditation techniques from a book or from the meditation resources right here on Verywell. Ultimately, if you can focus on your breath, on the present moment, or on any one thing for a while, you can now meditate. It does often take some practice, however, and some people find it difficult to "get it" in the beginning. Meditation also requires a little patience and may be difficult for people with little free time (like some stay-at-home mothers who get very little privacy from small children). However, the time and effort it takes to learn and practice is well worth it in terms of the benefits it provides. Consistent practice matters more than long practice. This means that it's better to meditate for five minutes, six times per week than for 30 minutes once a week. The former can calm your body's stress response several times in a week, while the latter may calm your body into a deeper state of relaxation, but it will only reverse your stress response once. In addition, you are more likely to stick with a regular meditation practice if you can start with short, daily sessions than if you feel you need to find time for longer sessions in order to practice. It is more likely that this self-imposed pressure will lead to you not finding time for it, then losing the motivation to try. Regular practice matters more than "perfect" practice. This means that, rather than concerning yourself too much about what position to sit in, what technique to try when you sit, how long to sit, or what time of day, you should just sit and meditate. The rest will fall into place if you just begin, but if you feel the need to work these details out before you can start, you may find it more challenging to get started at all. There really is no "wrong" way to meditate anyway; any meditation is better than none. If you notice your mind wandering, that's good. Meditation can be challenging for some people, particularly perfectionists. We sometimes fall into the trap of wanting to do it "right" and becoming frustrated with ourselves when our mind drifts off. The thing to remember is that if you notice this happening, that's a good thing—you noticed. Noticing and redirecting your thoughts back to the focus of your meditation (your breath, the present moment, or whatever you are choosing as your focus) is the real point of meditation. It's virtually impossible to prevent your mind from wandering anyway. Even long-time meditation practitioners find it challenging. This may come as a surprise, but even those who have been meditating for years can find it hard to stay present. This is perfectly normal for anyone. It's all part of meditation, so don't let it discourage you. There are many forms of meditation that bring these fantastic benefits. Some may feel more comfortable for you to practice than others, so it's a great idea to try a sampling of them and repeat the techniques that seem to fit best for you. The most important thing to remember is to practice meditation for a few minutes per day and to try to sit for at least five minutes each session. If you practice meditation while you are not in the midst of a stressful situation, you will find it easier to use it as a calming technique when you need it. Even if you plan to use it only as needed and not as a daily exercise, it is a good idea to practice meditation when you aren't feeling particularly stressed first, rather than trying it for the first time when you're feeling overwhelmed—unless, of course, you can't find a time when you don't feel this way. If you don't know where to start, you may simply focus on listening to your breathing for five minutes. To do this, relax your body, sit comfortably, and notice your breath. If you find yourself thinking of other things, simply redirect your attention back to your breath. Here is a sampling of meditation techniques to try. May you find the relief you seek. Astin JA, Shapiro SL, Eisenberg DM, Forys KL. Mind-Body Medicine: State of the Science, Implications for Practice. The Journal of the American Board of Family Practice March / April 2003.Bonadonna, Ramita PhD. Meditation's Impact on Chronic Illness. Holistic Nursing Practice. November/December 2003. Bowen S, Witkiewitz K, Dillworth TM, Chawla N, Simpson TL, Ostafin BD, Larimer ME, Blume AW, Parks GA, Marlatt GA. Mindfulness meditation and substance use in an incarcerated population. Psychology of Addictive Behaviors. September 20, 2006. Chan, Cecilia, et al. The effect of a one-hour Eastern stress management session on salivary cortisol 403. Stress and Health. February 20, 2006. Pagnoni G, Cekic M. Age Effects on Gray Matter Volume and Attentional Performance in Zen meditation.. Neurobiology of Aging. July 25, 2007.